To compare the visual and refractive outcomes of femtosecond laser-assisted LASIK with small-incision lenticule extraction (SMILE) in terms of visual acuity, contrast sensitivity, aberrations, and dry eye. A single-center prospective randomized study in which patients diagnosed as having myopia presenting for refractive correction were allocated to either a LASIK or SMILE group. 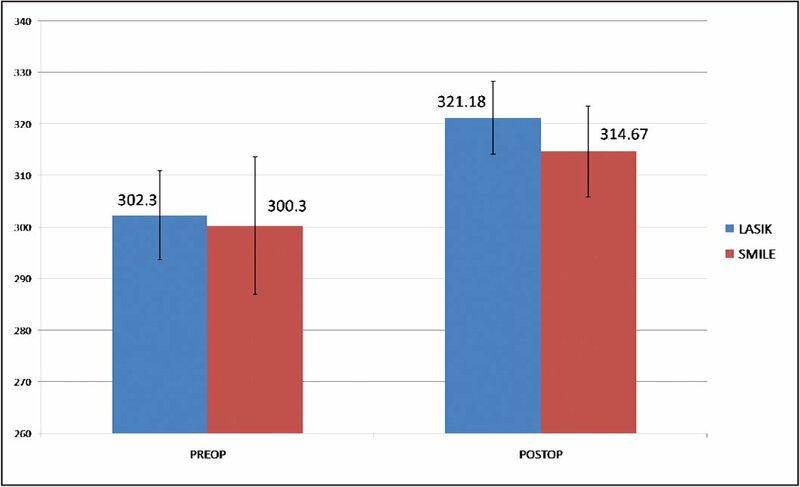 The primary outcome measures were refractive efficacy, predictability, and safety, postoperative contrast sensitivity, aberrations, and dry eye status. Patients were followed up at days 1 and 15 and 3 months; postoperative uncorrected visual acuity (UCVA), aberrations, dry eye, and contrast sensitivity were recorded and compared to preoperative data. Two postoperative subjective questionnaires were used to assess pain, pricking sensation, redness, glare, and overall patient satisfaction. At day 1 postoperatively, 48 (96%) of 50 eyes in the SMILE group achieved a UCVA of 20/20 compared with 46 (92%) of 50 eyes in the LASIK group. At day 15 postoperatively, contrast sensitivity was similar in the two groups (P = .15), but by 3 months, it was better in the SMILE group than the LASIK group at all spatial frequencies (P < .0001). At 3 months postoperatively, 42 (84%) eyes in each group achieved a UCVA of 20/20, with 6 (12%) eyes in the SMILE group and 2 (4%) eyes in the LASIK group achieving 20/15. Higher-order aberrations at 3 months postoperatively were significantly higher in the LASIK group (0.437 ± 0.103 µm) than in the SMILE group (0.267 ± 0.07 µm; P < .001). Postoperative dry eye and glare were significantly more common following LASIK (P < .001). Three-month results demonstrate that refractive accuracy, dry eye, contrast, and induced aberrations are better following SMILE rather than LASIK. From SuperSpeciality Eye Hospital, Bangalore, Karnataka, India. More recently developed is refractive lenticule extraction, which uses a femtosecond laser to create an intrastromal corneal lenticule (the removal of which alters the shape of the cornea), thereby correcting myopia. It encompasses two different techniques: femtosecond lenticule extraction (FLEX) and small-incision lenticule extraction (SMILE). SMILE is a more recent flapless subtype in which the lenticule is extracted through a small arcuate incision (2 to 4 mm). This allows for greater stability because most of the Bowman’s layer remains intact. Studies have shown that SMILE is associated with lower topographic changes and less inflammation and keratocyte apopotosis than FS-LASIK, particularly for higher levels of correction of myopia.6,7 Because the procedure is flapless, most flap-related complications are not observed with SMILE. The aim of the current study was to evaluate the efficacy and safety of SMILE compared with FS-LASIK. Our primary hypothesis (null hypothesis) states that SMILE is better or comparable to LASIK for correction of myopia in terms of refractive accuracy and quality of vision (ie, postoperative aberrations and contrast sensitivity). 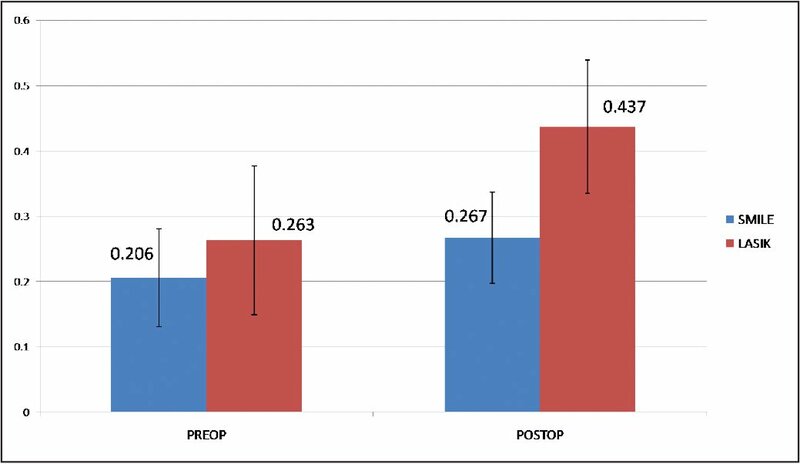 Primary outcome measures were refractive efficacy, predictability, and safety, postoperative contrast sensitivity wavefront aberrations, and tear film abnormalities. Patients presenting to our hospital for correction of myopia between November 2012 and May 2013 were selected for this study. Patients were randomized using the Alternate Allocation method. All patients were given a number (1 to 50). The odd-numbered patients underwent FS-LASIK in both eyes and the even-numbered patients underwent SMILE in both eyes. The study was approved by the local ethics committee and performed with informed consent from all patients in accordance with the tenets of the Declaration of Helsinki. Inclusion criteria were: spherical equivalent up to −10 diopters (D), age of 21 years or older, stable refraction for at least 1 year, soft contact lens use discontinued for 1 week and rigid gas permeable lens use discontinued for 3 weeks prior to the procedure, minimum corneal thickness of 480 µm, residual stromal bed of at least 250 µm, and ability to understand and willingness to participate in all follow-up visits. Exclusion criteria included: evidence of residual or active ocular diseases such as herpetic keratitis, uveitis, glaucoma, visually significant cataract, retinal diseases such as retinal dystrophies or diabetic retinopathy, corneal dystrophies, keratoconus, history of corneal trauma or surgery, severe dry eyes (Schirmer’s 2 test value < 10 mm), use of systemic medications likely to affect wound healing (eg, corticosteroids or antimetabolites), an immunocompromised state, or women who were pregnant or nursing. A thorough preoperative examination was conducted on each eye, including Snellen corrected distance visual acuity (CDVA), manifest refraction (sphere, cylinder, and spherical equivalent), corneal topography (Orbscan; Bausch & Lomb, Rochester, NY, and Pentacam; Oculus Optikgeräte GmbH, Wetzlar, Germany), functional acuity contrast test (FACT), Schirmer’s 1 and 2 tests, tear break-up time (TBUT), tear osmolarity (TearLab, San Diego, CA), and aberrometry (iTrace; Tracey Technologies, Houston, TX). Vision Sciences Research Corporation’s patented FACT chart is a sine-wave grating chart that tests five spatial frequencies (sizes) and nine levels of contrast. Tested monocularly, the patient determines the last grating seen for each row (A, B, C, D, and E). The test is performed at normal room illumination (30 to 70 foot-lamberts/68 to 240 cd/m2) at a distance of 10 feet. Absolute values of contrast sensitivity were obtained for each patient and mean and standard deviation values were then calculated. Wavefront measurements were taken using the Hoya iTrace-combination ray-tracing wavefront aberrometer with a 5.0-mm analysis diameter and included the root mean square (RMS) HOAs: total, coma, and spherical aberrations. The iTrace sequentially projects 256 near-infrared laser beams in the eye to measure forward aberrations. Data are displayed in the form of wavefront maps showing the RMS value for each aberration. Patients were given a subjective questionnaire on day 1 to assess for any pain, pricking sensation, watering, and redness and at day 15 to assess glare and overall patient satisfaction (Figures A–B, available in the online version of this article). The level of pain was assessed using the Wong–Baker FACES Pain Rating Scale. Patients indicated either “yes” or “no” for the presence or absence of pricking sensation, watering, and redness. 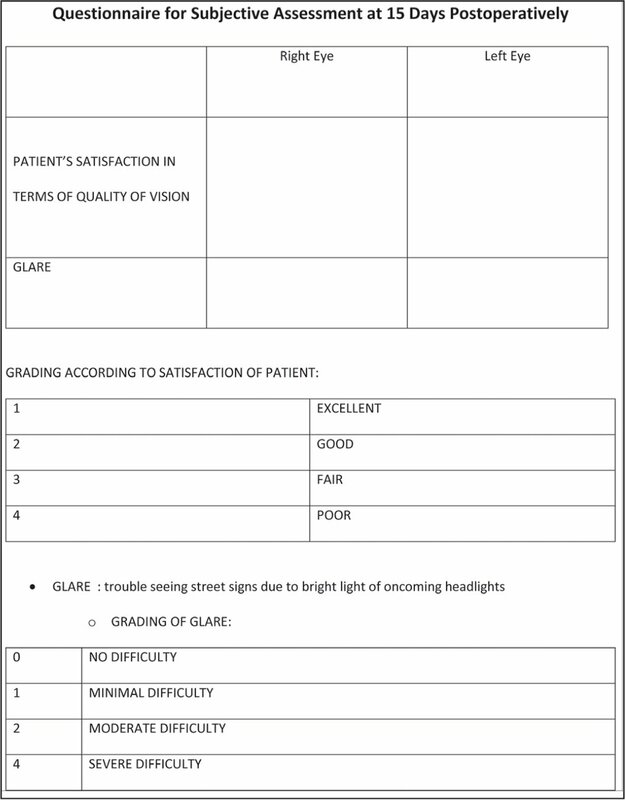 Patient satisfaction was measured on a scale of 1 (excellent) to 4 (poor) and glare was graded on a scale of 0 (no difficulty) to 4 (severe difficulty). All surgical procedures were performed by a single surgeon (SG). LASIK flaps were created using the 60-kHz IntraLase femtosecond laser (Abbott Medical Optics, Inc., Santa Ana, CA) with the following parameters: 110- to 120-µm flap thickness, 8.5- to 8.8-mm flap diameter, 90° hinge position, 4.14-mm flap width, 0.85-µJ bed energy, 1.0-µJ side-cut energy, and 6-µm spot and track distance. Following flap creation, the patient was shifted to an excimer laser (SCHWIND AMARIS; SCHWIND eye-tech-solutions, Kleinostheim, Germany) where the flap was lifted, laser focused onto the stromal bed, and ablation centered using pupillary offset. Following laser ablation of the stromal tissue, the flap was replaced and the stromal bed was washed with balanced salt solution. SMILE was performed using the VisuMax femtosecond laser (Carl Zeiss Meditec, Jena, Germany). The following parameters were used: 100-µm cap thickness, 7.5-mm cap diameters, 6.0- to 6.5-mm optical zone, 500-kHz repetition rate, 35 to 37 (130 nJ) energy cut index, 2-mm side-cut incision, and 4.5-µm spot and track distance. The patient was positioned under the curved contact glass of the femtosecond laser and asked to fixate on a blinking target. When appropriate centration was achieved, suction was applied and the laser started. Following creation of the lenticule, the incision was opened and the two planes of the lenticule were identified. A thin blunt spatula was used to dissect the superficial and deep planes of the lenticule and break the remaining tissue bridges, thus separating the lenticule from the surrounding stroma. This lenticule was grasped with a pair of forceps and extracted through the 2-mm incision. The corneal interface was then flushed with balanced salt solution. The postoperative regimen included prednisolone acetate, ofloxacin, and lubricating eye drops. Follow-up visits were on days 1 and 15 and 3 months. UCVA, CDVA, and refraction were tested on day 1. Corneal topography, wavefront measurement (iTrace), Schirmer’s 1 and 2 tests, TBUT, and tear osmolarity (TearLab) and FACT for contrast sensitivity were tested at day 15 and at 3 months. Data analysis was done with the help of a computer using SPSS software (version 17.0; SPSS, Inc., Chicago, IL) for Windows. Using this software, range, frequencies, percentages, means, standard deviations, chi-square, and P values were calculated. A paired t test was used to test the significance of difference between quantitative variables and Yate’s chi-square test for qualitative variables. A P value of less than .05 denoted a significant relationship. One hundred eyes of 50 patients underwent laser refractive surgery for correction of myopia, myopic astigmatism, or both. There were 50 eyes (25 patients) in the SMILE group and 50 eyes (25 patients) in the LASIK group (Table 1). Twenty-one patients were men (42%) and 29 were women (58%). Patients were between 21 and 51 years of age (mean age: 27.4 ± 5.6 years). The preoperative mean spherical equivalent was −3.54 ± 2.26 D (range: −0.75 to −9.00 D; P = .014) and −4.95 ± 2.09 D (range: −0.75 to −9.00 D; P = .014) in the LASIK and SMILE groups, respectively (Figure 1). The postoperative mean spherical equivalent was −0.27 ± 0.24 D (range: −0.12 to −0.62 D) and −0.14 ± 0.28 D (range: −0.12 to −0.50 D) in the LASIK and SMILE groups, respectively (P = .043). 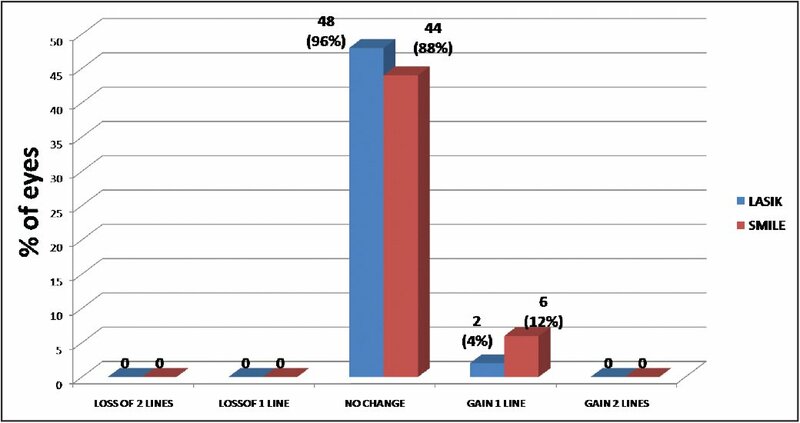 At day 1 postoperatively, 44 (88%) eyes in the LASIK group and 48 (96%) eyes in the SMILE group achieved a UCVA of 20/20; 6 (12%) eyes in the LASIK group and 2 (4%) eyes in the SMILE group achieved a UCVA of 20/25. At 3 months postoperatively, 42 (84%) eyes in each group achieved a UCVA of 20/20, with 6 (12%) eyes in the SMILE group and 2 (4%) eyes in the LASIK group achieving 20/15 (Figure 2). There was no loss of CDVA in any eye (Figure 3). 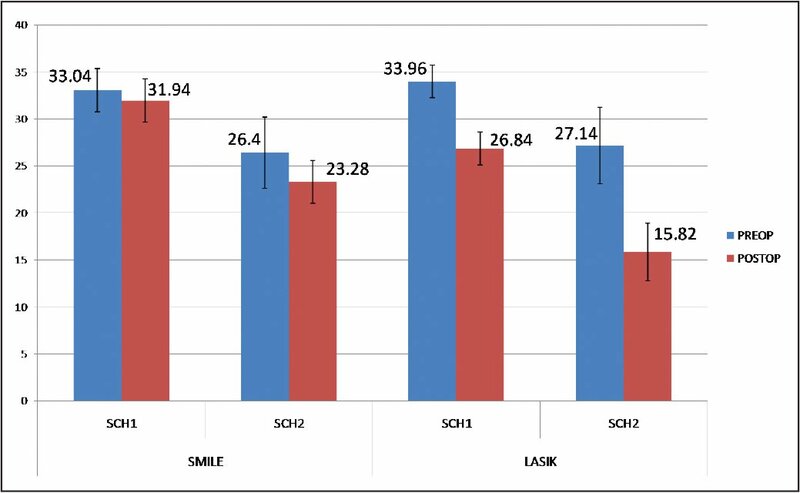 Distribution of the change in Snellen lines of corrected distance visual acuity in the LASIK and small-incision lenticule extraction (SMILE) groups. HOAs at the 5.0-mm analysis diameter increased in both groups postoperatively (Figure 4). The occurrence of HOAs was significantly lower in the SMILE group than in the LASIK group (P < .0001). Contrast sensitivity reduced postoperatively in both groups at all spatial frequencies. At day 1, contrast sensitivity was better in the LASIK group than in the SMILE group. 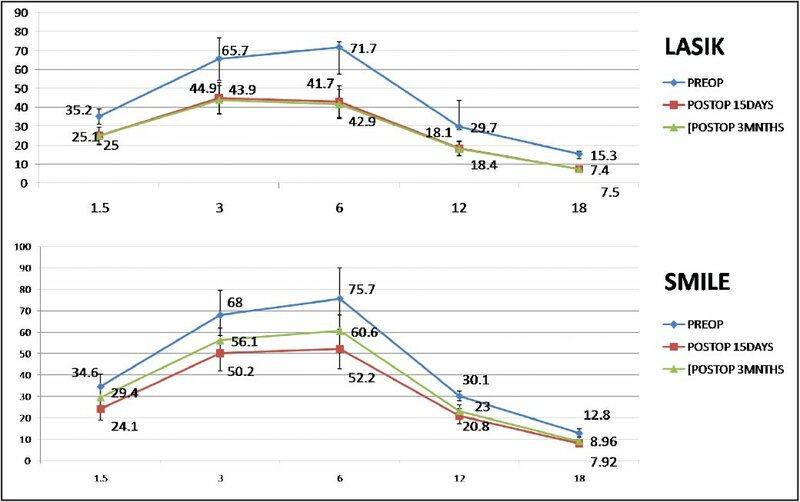 However, by day 15, contrast sensitivity improved in the SMILE group, particularly at higher spatial frequencies (18 cycles/degree), and the difference between the SMILE and LASIK groups was no longer significant (P = .15). By 3 months postoperatively, contrast sensitivity in the SMILE group was better than in the LASIK group at all spatial frequencies (P < .0001) (Figure 5). A reduction in Schirmer’s 1 and 2 tests and TBUT was seen in both groups at 3 months postoperatively (Figures 6 and C [available in the online version of this article]). 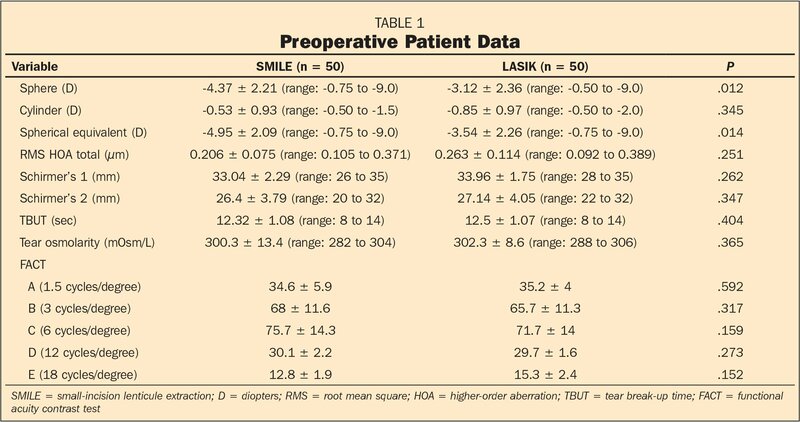 These postoperative values were significantly lower in the LASIK group than in the SMILE group (P < .0001). Tear osmolarity increased in the LASIK and SMILE groups. The difference between the two groups was statistically significant (P < .001) (Figure D, available in the online version of this article). The mean score on the subjective questionnaire for pain, redness, watering, and pricking sensation was 0.52 ± 1.02 and 0.2 ± 0.57 in the LASIK and SMILE groups, respectively, with a higher complaint score in the LASIK group. The mean patient satisfaction score was 2.56 ± 0.5 and 2.62 ± 0.49 in the LASIK and SMILE groups, respectively (P = .547). The mean score for glare complaints was 2.84 ± 0.79 and 1.96 ± 0.73 in the LASIK and SMILE groups, respectively, with glare more significant after LASIK (P < .001). In the LASIK group, 4 eyes had suction loss and the procedure had to be repeated. Three eyes had flap wrinkles on day 1 postoperatively. These patients were taken back to the operating room, where the stromal bed was washed and the flap was repositioned. A bandage contact lens was placed in these eyes for 24 hours. In the SMILE group, 3 eyes had suction loss intraoperatively. They were re-docked and the procedure was completed. 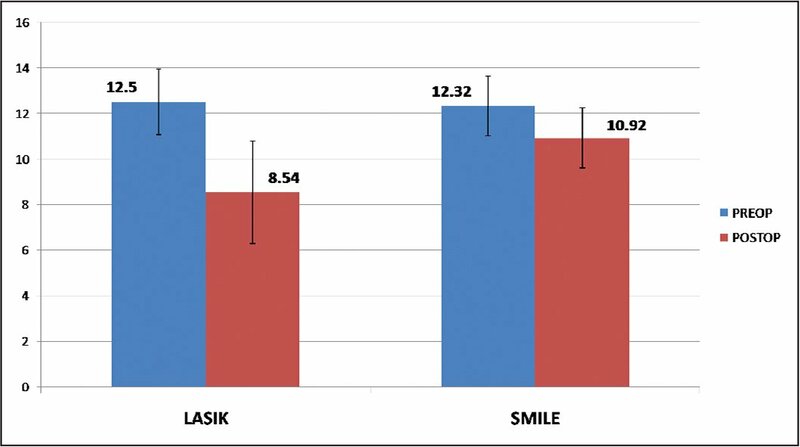 Our results showed that both LASIK and SMILE were safe, effective, and predictable for the correction of myopia and myopic astigmatism, although the results of SMILE were superior to those of LASIK. In our study, no eye had a loss of CDVA. We found a significant difference in the refractive efficacy of the two procedures. Ninety-six percent of eyes in the SMILE group achieved a UCVA of 20/20 or better, whereas only 88% in the LASIK group achieved this benchmark at 3 months postoperatively. Furthermore, the safety and predictability, as indicated by the gain in CDVA and postoperative residual error (spherical equivalent), was significantly better in the SMILE group than in the LASIK group (P < .001). We believe this is because refractive accuracy depends on the accurate removal of stromal tissue intraoperatively. A variation in hydration of the corneal stroma is the most likely cause for underablation or overablation of stromal tissue.13–15 In LASIK, the flap needs to be lifted before excimer laser ablation can be performed. This exposes the stroma to hydration changes before refractive correction. On the other hand, in SMILE, the refractive lenticule is cut by a femtosecond laser prior to any disturbance of the stroma. It is likely that this difference contributed to greater predictability. With regard to contrast sensitivity, a study on SMILE by Sekundo et al.16 found no significant decrease in mesopic contrast postoperatively, whereas in another comparative study between SMILE and FS-LASIK, Gertnere et al.17 found better mesopic contrast sensitivity in the SMILE group than in the LASIK group. Montés-Micó et al. found a statistically significant reduction (P < .01) in contrast sensitivity at high spatial frequencies (12 and 18 cycles/degree) under mesopic conditions following LASIK.18 In the current study, the postoperative contrast sensitivity was lower in the SMILE group than in the LASIK group at day 1 postoperatively, but was significantly higher than the LASIK group at 3 months postoperatively. The LASIK group showed no significant improvement in contrast sensitivity. However, contrast sensitivity in the SMILE group showed a significant improvement from day 1 to 3 months postoperatively. This could be because of interface healing commencing from day 1 onward. Another factor could be lower induction of HOAs following SMILE. HOAs induced following LASIK may be the reason for lower contrast sensitivity. Our study demonstrated a significantly lower incidence of dry eyes in the SMILE group compared with the LASIK group. During LASIK, sub-basal and superficial stromal nerve bundles get cut during flap creation. Subsequent excimer ablation further severs stromal nerve fiber bundles, leading to decreased corneal sensations and increased dry eye symptoms. Although postoperative dry eye has decreased since the introduction of the femtosecond laser for flap creation,23 it is still significant. In SMILE (a flapless procedure), the anterior stromal nerve plexus is disrupted significantly less than in FS-LASIK,24 resulting in fewer dry eye symptoms postoperatively. Comparison of RMS HOAs showed a significant difference between the groups, with aberrations lower in the SMILE group than in the LASIK group. Lin et al. also found higher-order and spherical aberrations were lower in the SMILE group than in the FS-LASIK group.11 We found a 0.02- and 0.06-µm and a 0.10- and 0.14-µm increase in coma and spherical aberrations following SMILE and LASIK, respectively. In a study by Shah et al.,25 the increase in coma and spherical aberrations following SMILE were 0.07 and 0.11 µm, respectively. Both FS-LASIK and SMILE are excellent for the correction of myopia. SMILE is gaining popularity, fueled by the limitations of LASIK (eg, reduced corneal biomechanical strength, increased postoperative HOAs, low contrast sensitivity under mesopic conditions, and dry eyes). Being a painless procedure with high refractive accuracy and fast postoperative recovery, SMILE provides all of the advantages of LASIK while avoiding the limitations so commonly associated with it. Dong Z, Zhou X, Wu J, et al. Small incision lenticule extraction (SMILE) and femtosecond laser LASIK: comparison of corneal wound healing and inflammation. Br J Ophthalmol. 2014;98:263–269. Hu Y-K, Li W-J, Gao X-W, et al. Comparison of small incision lenticule extraction and femtosecond laser assisted LASIK for myopia. Int Eye Sci. 2013;13:2074–2077. Montés-Micó R, España E, Menezo JL. Mesopic contrast sensitivity function after laser in situ keratomileusis. J Refract Surg. 2003;19:353–356. Shoja MR, Besharati MR. Dry eye after LASIK for myopia: incidence and risk factors. Eur J Ophthalmol. 2007;17:1–6. 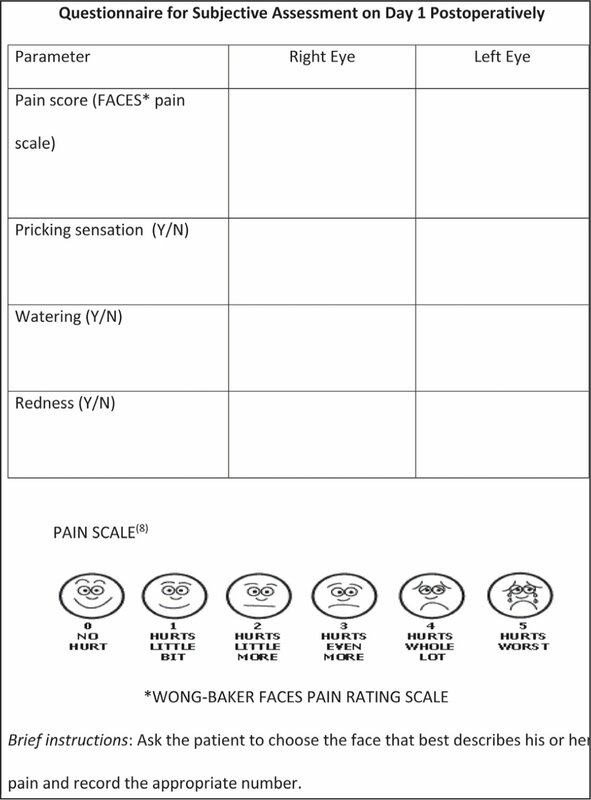 Figure A. Wong–Baker FACES Pain Rating Scale questionnaire. Figure B. Questionnaire for subjective assessment.